Sales Promotion Techniques and VAT in the EU provides more accurate and comprehensive information on how a more ideal and clear VAT treatment for the use of sales promotion techniques (SPTs) can be conceived, not only providing neutrality for businesses using SPTs but also respecting the other key principles and features of the VAT system. SPTs are a common facet of consumer life, with many companies offering price reductions, bonuses, or other deals in order to attract or retain customers. Although VAT on advertising costs is in principle fully deductible, problems frequently arise when products are supplied as part of a sales promotion. 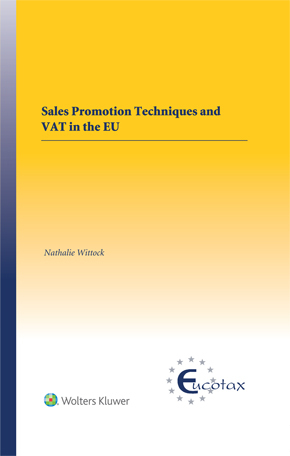 This book provides the first in-depth investigation of the extent to which the current VAT treatment in the EU of the various SPTs corresponds to the core properties of the VAT, with particular attention to the so-called neutrality principle. What are the key considerations for effectively determining whether the supply of a benefit upon fulfillment of a certain condition by a customer constitutes an SPT or a barter? To what extent are the VAT consequences of the use of SPTs compliant with the principle of neutrality? What distinguishes the VAT treatment of an SPT whereby a sales promotor both finances and supplies a benefit from that of an SPT whereby a sales promotor finances but does not himself supply a benefit? What legislative changes can be made in order to reach a more ideal and clear VAT treatment of SPTs in the EU? Not only considering the principle of neutrality but also the other key features and principles of EU VAT. The research is conducted mainly through a review of European legislation, policy documents, and CJEU case law and the Belgian interpretation thereof. Where room is left for different interpretations, some viewpoints of EU VAT in the Netherlands, and the United Kingdom, as well as in the corresponding system of New Zealand, are considered. With the finely tuned analysis presented in this book, readers can gain a good understanding of the current VAT treatment of sales promotion techniques and when these can currently (unjustly) result in a VAT cost. Practitioners can ensure an appropriate argumentation on the VAT treatment of SPTs with national tax authorities or before courts. As the first overall study on the VAT treatment of SPTs, clearly discussing the issues and legislative gaps and making concrete suggestions for future legislation, it is sure to be welcomed also by academics and EU policymakers.